The announcement that Brixham coastguard station could close has led people to question what impact it would have on Devon. It is the loss of local knowledge and prompt arrival at minor incidents that concerns some. Without Brixham the nearest stations will be Falmouth and Southampton, more than 200 miles (320km) apart. 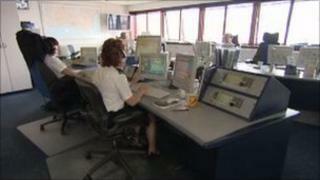 The government has said the plans are part of a national reorganisation to modernise the service and save money. The plans include reducing 18 stations to eight, with just three operating 24 hours a day in Aberdeen, Dover and Solent. But many people in the maritime industry say they rely on the current service. Skipper of the Carhelmar, Gerry Podschies, said: "We've had an engine room fire on the boat, problems with gears, mechanical problems and they've been able to help us out and watch over us. "It's reassuring to know that someone is looking after you." The Protecting our Seas and Shores in the 21st Century report says current technology and communication systems need "updating and expanding" to handle the volume of incidents the Maritime and Coastguard Agency attends. But Rick Smith from Brixham Trawler Agents said: "The technology will do it but around the shore there are all sorts of little locations and coves, some with the same names, and at a distance people will not know them." Mr Smith also said incidents such as rescuing children who get into difficulty, cliff falls, or recovering those who have had heart attacks in remote places could become less efficient. During the summer many people were rescued after getting cut off by the tide and activities such as coasteering - swimming, jumping and scrabbling around sections of coastlines - saw Brixham Coastguard called out to a variety of incidents. Nine people were rescued off Redgate Beach in Torquay following several injuries including a dislocated shoulder and in November two instructors received leg injuries at Anstey's Cove while scouting for new coasteering sites. Bruce Cowling from the Disabled Sailing Association in Torbay said: "If I go to sea on a Sunday the first thing we do is notify Brixham coastguard of the time we're leaving, the time we're returning and the amount of people we've got aboard, you wont be able to do that anymore, that is what I call sea safety." But the possible closure of Brixham does not meant the RNLI service will be lost. Tamsin Thomas from RNLI South West said: "We must now act as an independent charity and look into what those affects might be and how best we can accommodate them. "Because we are an independent charity we can continue to use the lifeboats at sea and we don't face cuts. "Our volunteers at a local level know their patch very well and will be able to provide valuable information." If the Brixham Coastguard Station plans are approved after the 14-week consultation period, the station will close in 2012 along with Clyde, Milford Haven, Yarmouth and Portland.